For lovers of Venice September 5 2018 is a date to look forward to and one that you don’t have to travel to Venice to enjoy. 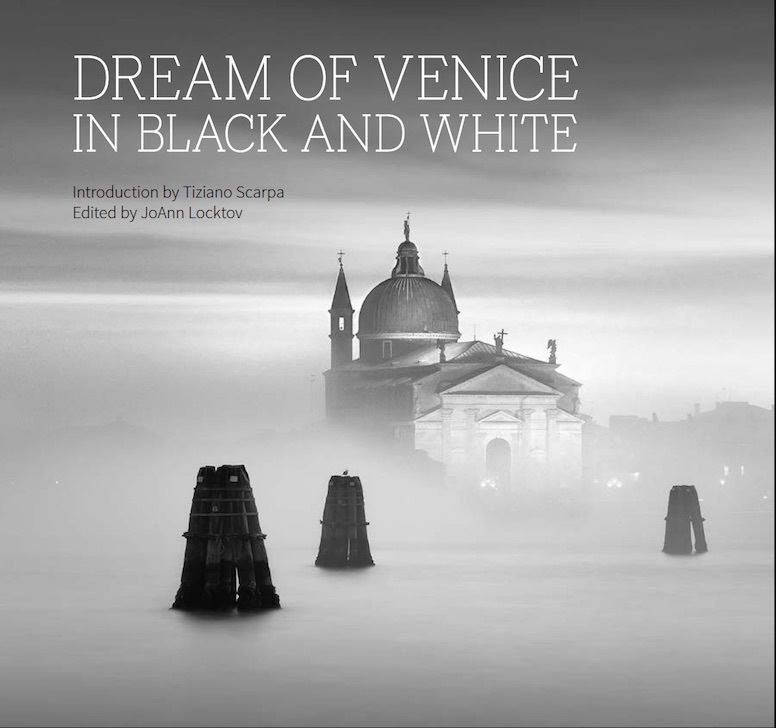 It sees the publication of Bella Figura Publications’ latest volume: Dream of Venice in Black and White. Since 2014, Bella Figura’s founder JoAnn Locktov has been indulging the appetite of Venetophiles everywhere with her high-quality picture books, Dream of Venice and Dream of Venice Architecture, which will now form a trinity with Dream of Venice in Black and White. The photographs in the first Dream of Venice come with delicious sides of anecdotes about Venice from such luminaries as Woody Allen, Erica Jong, and director Nicholas Roeg of Don’t Look Now fame. The latest volume has been stripped of words, just as the photographs have been stripped of colour, save for an introduction by Venetian writer Tiziano Scarpa. Venice is a city where one overdoses on colour from the unbelievable turquoise of the canals in the eastern side of the city, to the terracotta rooftops marking the shape of the Venice from the air. Photographing it in black and white forces the reader into a different way of looking at Venice anticipated by Scarpa’s different way of looking at Venice and her people in his brilliant, if occasionally fanciful, introduction. Taking away Venice’s colour emphasizes the fragility, but also the timelessness of the city, which are two themes many of the photographs explore. We see Venice as she appears for a few days each year in the winter, when as Scarpa says, ‘the sky… [is] … the same color as the flagstones.’ In Dream of Venice in Black and White, Venice is trapped in an eternal winter. But this is an apt metaphor for the much-vaunted decline of Venice even if it has been a very long winter. The depopulation of the historic centre of Venice may only recently turned exponential, but it started in the seventeenth century. By the eighteenth century, Venice started taking on many of the characteristics that we now associate with theme parks and was to some extent a prototype Las Vegas. When the Republic fell in 1797 Venice lost its original purpose and began its transformation into a white-elephant city. The title of Thomas Mann’s Death in Venice resonated well in the nineteenth century as it was one step away from Death of Venice. The photographs in this book will break your heart with their beauty coupled with the realization that, if Scarpa’s introduction is correct, the Venetians and their way of life depicted here will soon disappear. Even ugly realities are transformed and transfigured, such as the arresting image of ‘The Old Man in Via Garibaldi’ by Alain Harmon. At least two of the photographs show images that must be on all tourists mobile phones, the view through grille of the Bridge of Sighs, and the basilica of Santa Maria della Salute as viewed from the Accademia Bridge, but again they are made unfamiliar by the lack of colour. All the details known to residents of the city are highlighted in the book. Seagulls, dogs, nuns, the contrast between young and old, and walking. Walking for Venetians takes on a new significance since it is the primary mode of transport around the city. Even if you take the vaporetto or have your own boat, every journey requires a surprising amount of walking. My favourite photograph in the book entitled is entitled ‘La Serenissima’ (an adjective that was coined to describe the Venetian Republic but which has in recent years come to refer to the city). An old woman, in a winter coat reminiscent of the robes worn by renaissance Venetian patricians, walks along the fondamenta on the Giudecca. For me, she is the young woman that renaissance and baroque painters used to symbolize Venice grown old and wandering the streets, the ghost of past glories. Once again, JoAnn Locktov has created a masterpiece that you will not be able to put down. You’ll be drawn into the book’s point of view, each photograph a meditation on Venice past, present, and future. And if this is not reason enough to buy it, like all of Bella Figura Publications’ books, a proportion of the proceeds go to support Venice, this time in the form of the IKONA photo gallery. But to find out more about that, you’ll have to buy the book and did I tell you that you can from September 5? DISCLAIMER: Bella Figura Productions supplied me with a free digital copy of Dream of Venice in Black and White in return for an honest review. Anglo-Venetian food and travel writer. Why do Italians go crazy about Italian cuisine? Those grey days, which are not as plentiful as you might think—there’s a lot of winter sun in Venice—are magical. Just like this book. Such a lovely review. I look forward to getting my copy when it is released. Especially since my friend Ieva will have one of her photos in the book. It really is a lovely book. I know you will appreciate it in particular. Thank you so much for this marvelous review, Luca. Your remarkable knowledge of Venice adds so much to the conversation. I am delighted that you have understood the book on so many levels. Often I will make a decision and assume no one but me will notice. But you did ~ you noticed! Thank you! It really was a pleasure spending time with the photos in this book and I look forward to spending hours with the print version when it’s out. An evocative review of a lovely book. It’s hard to say (or see) anything new or significant about a city as lionised as Venice but this review is thoughtful and considered and has a true feeling for the city, especially the city in winter. Scarpa’s is also an interesting thesis, in some ways righting the balance in favour of tourists in Venice, seeing it as a symbiotic relationship. However, apart from blaming the cruise companies, Scarpa seems wary of attributing blame on the bigger front, whether to the mayor, the city authorities, the business-political power nexus in Venice, or to dithering international bodies, such as Unesco. Venice is also personified as a player in its own destiny whereas the reality is rather different. Venice has little power per se yet many players manipulating the city for their own ends. Glossing over such issues is understandable: Scarpa is more a writer than a journalist and he also has to contend with swimming in the muddiest Venetian waters. Scarpa has definitely contributed to the debate about Venice, and possesses that rare insider-outsider perspective. Above all, the book’s images are, of course, gorgeous, forging their own narrative that at times runs parallel with the text and at times veers off into a different, more poetic world. This compelling creative divergence is only natural as the book represents the individual visions of many photographers, even if it’s been put together by a wonderful `overseeing’ eye, belonging to the publisher and Venice-lover Jo Ann Locktov herself. Even so, it does mean that there is also room on the market for a more critical look at the current Venetian scene, which was never the remit of this book. But the book certainly achieves whatever it set out to achieve and must be treasured for that. It is also a work of beauty and great thoughtfulness. I’m glad you like the review. As a Venetian, I guess it’s hard not to write about Venice from the heart. Thanks also for your point of view. You’ve practically written your own review, thank you! Luca’s Italy is about real Italian food. Not the food served worldwide in Italian restaurants, but the food cooked and eaten every day by Italians. @2018 - Luca Marchiori. All Rights Reserved.